I meet people who label a behavior of a horse as dominant but find that it is often a lack of manners. Many people do not know how to teach their horses and children to be polite, willing, respectful and have good focus and work ethics. Dominance is not a personality trait – it is a relationship state between two animals to decide who is going to control resources like food, water and mates. Horses cannot dominate people, they learn what works and what does not work in their efforts to get what they need or want. Aggression and dominance is not the same. 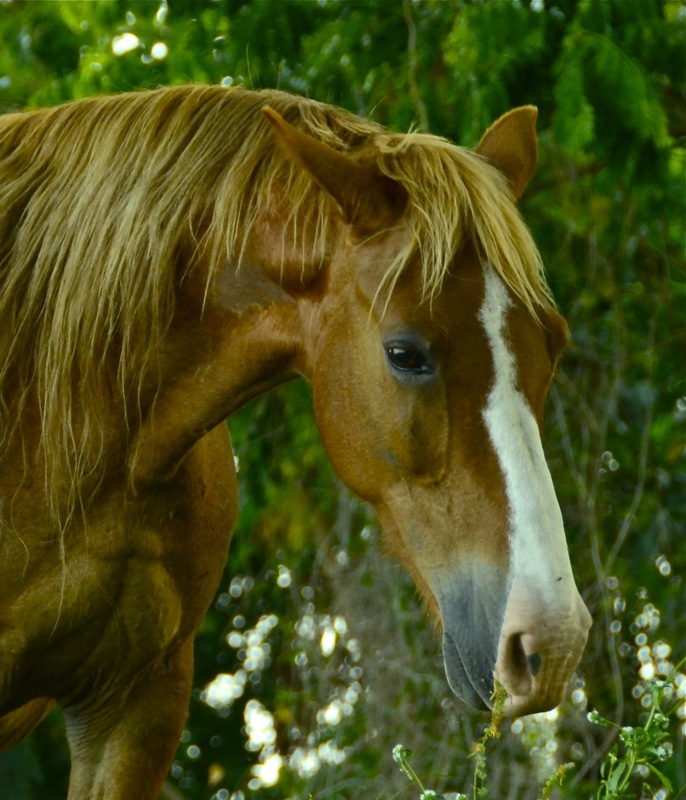 Horses can be aggressive in certain situations and it can be many reasons for that. It can be complex but aggression towards humans and dominance towards humans are different. 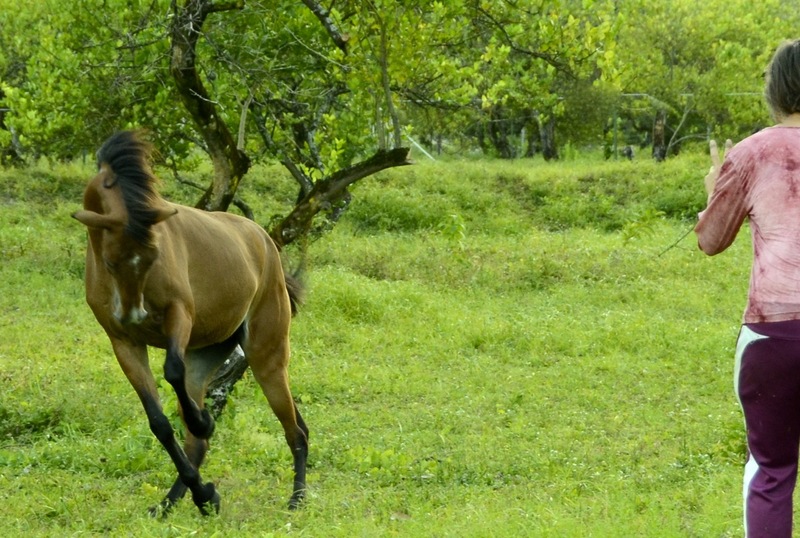 If a horse is aggressive towards you, dealing with it by being aggressive back may stop the behavior or it may not. Aggressive behavior can be suppressed – that means it does not appear anymore. You will have suppressed the behavior. But suppressed behavior does not mean changed behavior. The aggressive behavior is still in there. Depending on what caused the aggression, and given the right conditions, it may even come back. I think it is important to take the time and learn complexities of horses social life, life in the horse herd and how roles change in the herd. 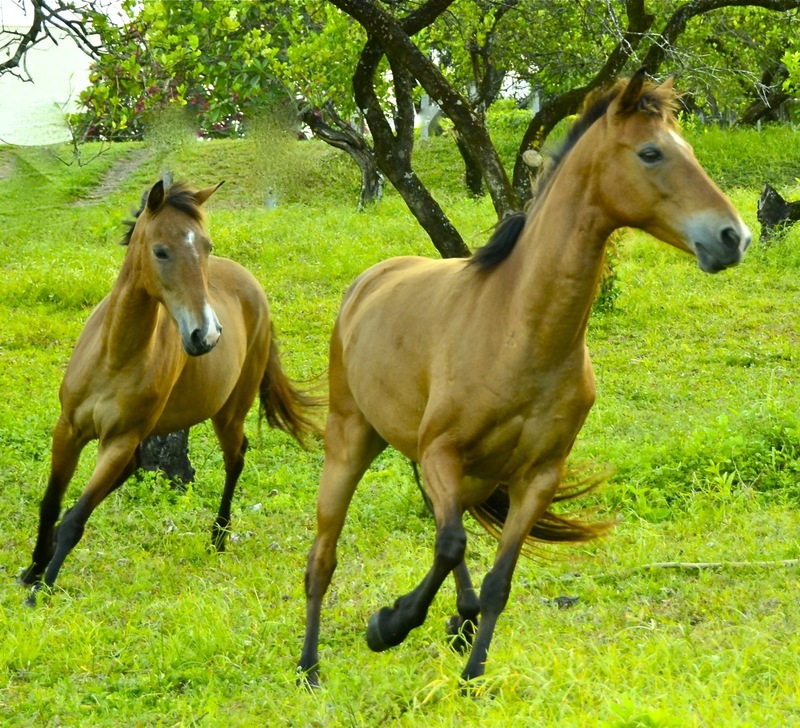 We need to keep in mind that the behavior in a wild herd with a lot of space to roam vs domesticated horses with limited spaces is very different. 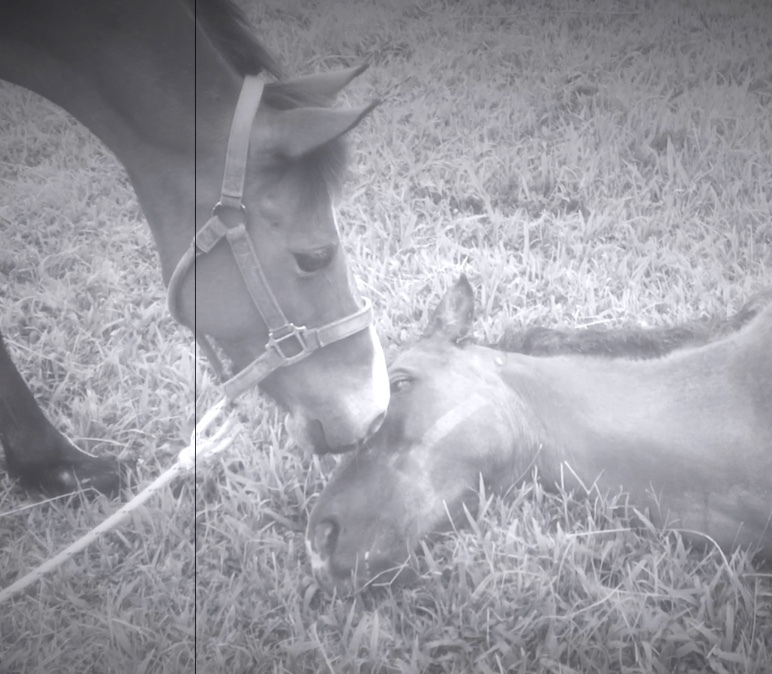 Video 3 – Gaia likes Jack …..
Let me know in the comment field and let’s talk about herd behavior. In our next blog you will hear how it is going with our riding program. Elena was out on her first trail ride yesterday with Jonna, Stina is riding Jack and Magic is getting back in training after a few months of holiday. I never thought riding could be so fulfilling and fun and we look forward to share more of our Journey with you! Sunshine, wind and rain from St. Vincent. Elena’s very first trail ride. Congratulations Jonna and Elena! Thanks Stina for another great post!!! In the first video when Darling was schooling Gia and Moonlight and when these two young girls where acting naughty, it reminded me of kids who sometimes test grownup boundaries to see what they can get away with and what not. So horses in that sense are so similar to us people and that’s why I think they are such an amazing teachers to us 🙂 It always amazes me how horses and Darling in this video moved Gia just with look and pure energy, its so powerful and yet so simple. I remember when I was younger and didn’t know much about horse language and their herd dynamics, I used to be so afraid of them but at the same time I just couldn’t stay away. In my eyes I saw them as very majestic, wild and divine creatures and every time I heard them running I felt such excitement in my body. But once I started to study more about them and their language my fear disappeared and I felt more confident being around them. I agree with you Stina that treating aggressive horses with being aggressive myself won’t work. They may obey you just to escape the punishment but sooner or later that suppressed emotion they have will come out and it can end bad. I believe that horses don’t get aggressive for no reason, because the underlying feeling behind that most of the times is fear. 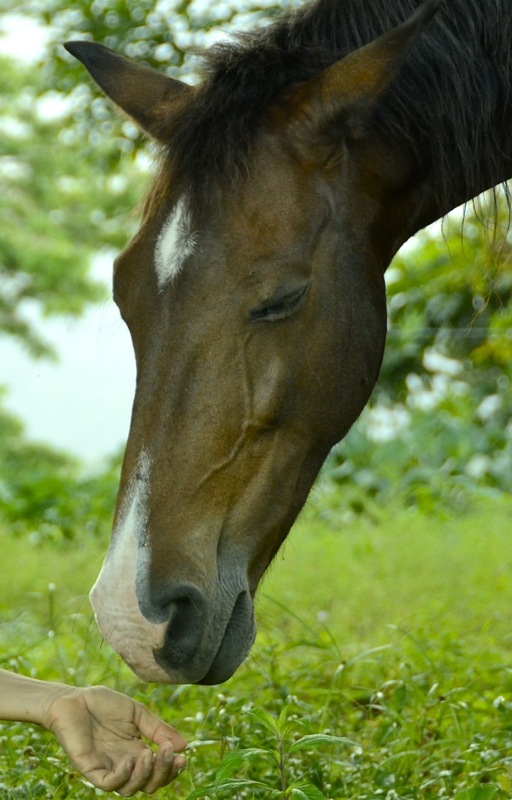 Patience, good leadership, healthy boundaries, lots of love and understanding horse language in my opinion are one of them most important things for creating deeper bond and connection with horses and for correcting aggressive behavior. Thank you for writing in. I have also found it very fascinating to study the herd. Just sitting observing is rewarding. 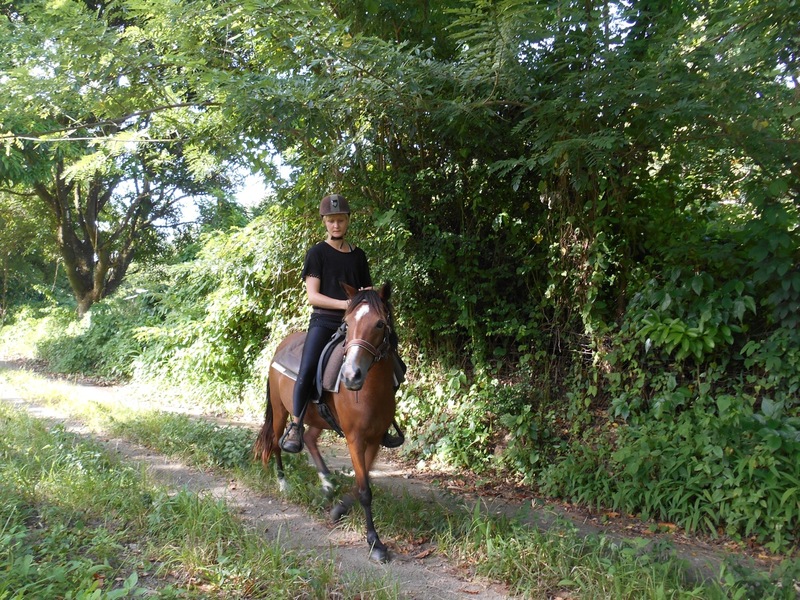 Here is Elena on her first trail ride, isn’t it amazing? It took some time Kristin, but now finally Elena is out on the trail and we had fun and connection along the whole way! Video with Kristine and Elena a couple of years ago! Thank you for another great blog with learning! Im not used to observe herds of horses very close so Its very nice and great learning for me to see these videos with explaining subtitles. Now I really understand what the waterhole rituals is all about, you can really clearly see the different rituals. It is very cool to see Darling move another horse with just body language and energy. Im also amazed by her fair rules, she is a great leader who sets bounderies when necessary but also is very patience and ignorance towards naughty behaviour. Like Kristine says, we can learn a lot from horses! I like how she direct all the horses in the introduction to the other horse, she really has a full time job there, like a teacher in a kindergarden. And she is doing such a good job, she is very clear and calm. I really love video 3, haha it makes me laugh a lot. Especially when both Gaia and Moonlight is facing their bums towards Jack when he is eating, wanting him so bad to smell them, haha! I admire both the girls eager to get attention and Jacks patience having them around all the time. I really enjoy working with Elena and its very joyful to see her progress. 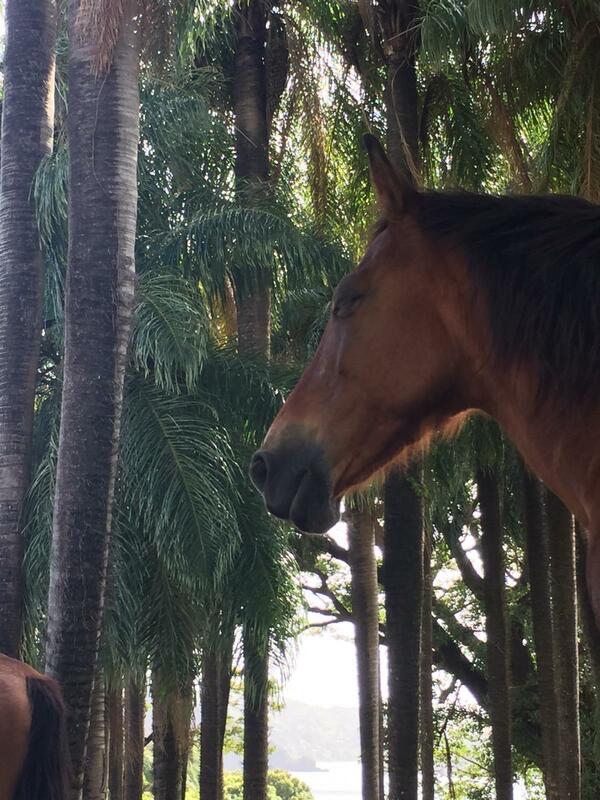 Its really like she has watched the other older horses for a long time and knoew exactly how to do things. I think she is a proud riding horse! I hope we can get started with Magic soon and have some progress there as well. Exciting times! Thanks again Stina for this experience. Thank you for your comment. Yes the “girls” are funny and really eager and gentle in their attempts to capture Jack’s attention! You are the first person except me with Kristine who has really worked with Elena, she is very special – also she does not have any bad experiences from the very beginning. All open. So easy to train once we have the understanding of communication with a horse. Yes – it is good you continue with Magic. She is something else, full of energy, very smart – she will give you her all once you have the connection.